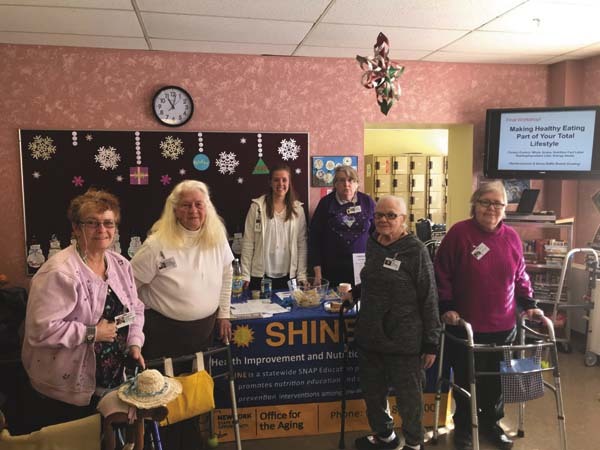 JOHNSTOWN — Throughout January, Molly Capito, a registered dietician and nutrition educator for the Seniors’ Health Improvement and Nutrition Education Program worked with residents of the Adult Day Health Care of Wells Nursing Home, according to a news release. SHINE is a Supplemental Nutrition Assistance Program education program that promotes nutrition education and obesity prevention interventions for older adults. Capito said she loved working with participants of the program as well as the staff of the Adult Day Health Care. Four nutrition workshops took place where participants learned about the latest dietary guidelines and how to incorporate simple physical activities into their daily routine. Participants enjoyed taste testing healthy foods and recipes, learned they enjoyed drinking seltzer water, practiced reading nutrition-fact labels, and participated in many other activities that occurred as part of SHINE. To learn about more SHINE workshops in the area, call Capito at (518) 843-2300.